The iPad 2 has already gone through dozens of reviews after its launch, but none of them is as scientific as this one. The guys over at DisplayMate have compares the tablet's 1024 x 768 pixels screen to the iPhone 4 Retina display and the iPhone 3GS modest HVGA screen. Here's some of the more interesting findings from the review - the iPad 2 display has a maximum brightness of Brightness 410 cd/m^2, which is pretty good, but not quite as impressive as the 541 cd/m^2 achieved by the iPhone 4 and even slightly short of the 428 cd/m^2 of the 3GS. However the black levels of the iPad 2 are the deepest of the trio at 0.43 cd/m^2 (iPhone 4 got 0.48 cd/m^2 and the 3GS 3.1 cd/m^2), which gave it a contrast ratio of 962:1. That's nearly seven times better than the 3GS but not quite as good as the iPhone 4. 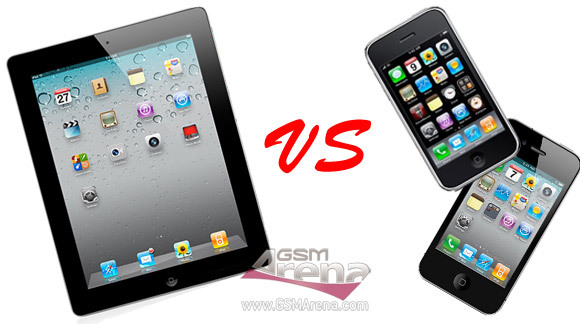 Still both the iPad 2 and the iPhone 4 pulled off excellent numbers, considering their LCD nature. Also the color temperature of the iPad 2 is said to be lower than that of the iPhone 4 so colors appear slightly warmer on the slate, compared to the smartphone. As far as viewing angles are concerned, all of the three tested devices lost more than 50 percent of their brightness at a 30 degree viewing angle, but the iPad 2 and the iPhone 4 still had pretty good contrast at that point (564 and 556 respectively). Finally, the reviewers measured the different screens power consumption. The iPhone 4 was found to need the least power at maximum brightness (0.42 watts), while the iPad 2 was sucking 2.7 watts. If you level the field by setting both to the same brightness and divide the iPad 2 consumption by the amount that its screen is larger then the iPhone 4, you get a pretty similar power efficiency though (0.32 watts for the handset vs 0.34 watts for the tablet). And it's a pretty good indicator of the progress Apple made when you compare the iPhone 4 to the 3GS. The HVGA screen on the previous-gen smartphone requires almost twice the power of its successor. Check out the complete iPad 2 screen review by following the source link below.